I'm a football fan (European football of course). In addition to my family, my work, my interests in economics, politics, cooking, and a host of other stuff, I enjoy football. Watching, playing and reading about it. It's a complete put-my-mind-at-rest kind of thing. So yesterday before the Chelsea-PSG game (I'm a fan of neither clubs actually), I read this article on Eurosport entitled: "Chelsea’s strange success under interim managers – here’s why they CAN win the Champions League". Anyway, there is a lot I can write about each and every fan-based bias I can think of, but I'll only focus on the two things seriously wrong with the arguments laid out in that article (and in sports conversations in general). The first is the lack of elementary statistical knowledge in recognizing one of the most central statistical findings - regression to the mean. What is regression to the mean? In simple terms this is a when a series of over-performance is followed by a decline in performance, or vice-versa, when a series of under-performance is followed with an upsurge in performance. So if you notice extremes about a certain observed action at one point in time expect the next set of measurements to move it towards the average. Of course this is mostly applicable to situations that have a lot to do with luck (e.g. rolling a dice - at one point the average will regress towards 3.5 - without exception). Yes, skills will be important for different occupations, but in some more than in others luck is often key. Sports is the best example. The stock market is another one. Of course, the professionals in each of these two fields will tell you how luck has little to do with their success, but they tend to be disillusioned and overconfident about their own performance most of the time anyway. 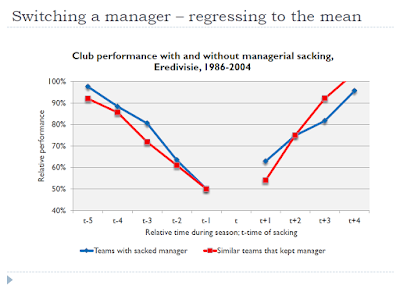 What you see here is data on managerial sackings and before and after club performance, plotted from a research by Bas ter Well on the Dutch first division, Eredivisie, on an 18 year sample (read the news story about the research here). 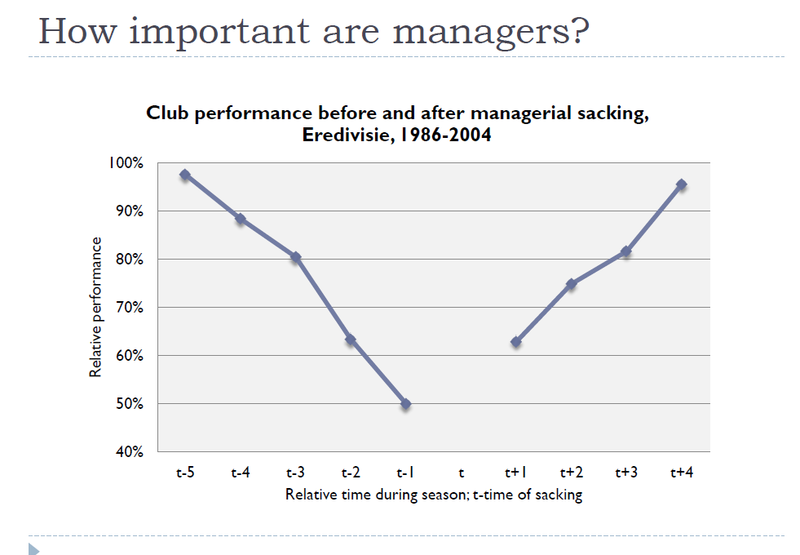 In the graphs time t is time of sacking; t - n (n=1...5) is performance before the sack; t + n is performance after the sack. On the y-axis relative performance measures how the club was doing relative to the games before the first data point (t - 5). So when a team drops from 100% to 50% in relative performance, this means that if they got, say, 20 out of 30 points earlier in the season (66.6% success rate), now they only got 5 out of the possible 15 points (33.3% success rate) in the next 5 games (just before the sacking). So their performance deteriorated rapidly. 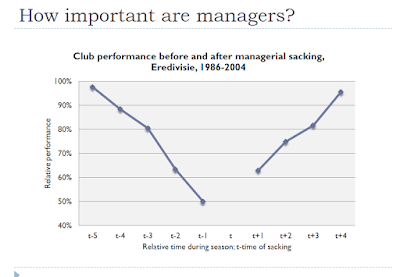 When I show the students the first slide, they immediately jump to conclusions about how this is proof that owners should fire managers - performance is much better after the sacking. But that conclusion is wrong. The best way to prove it is to look at similar teams that had a poor run of form, but decided to stick to their manager instead of firing him (think of it as a control vs treatment group). 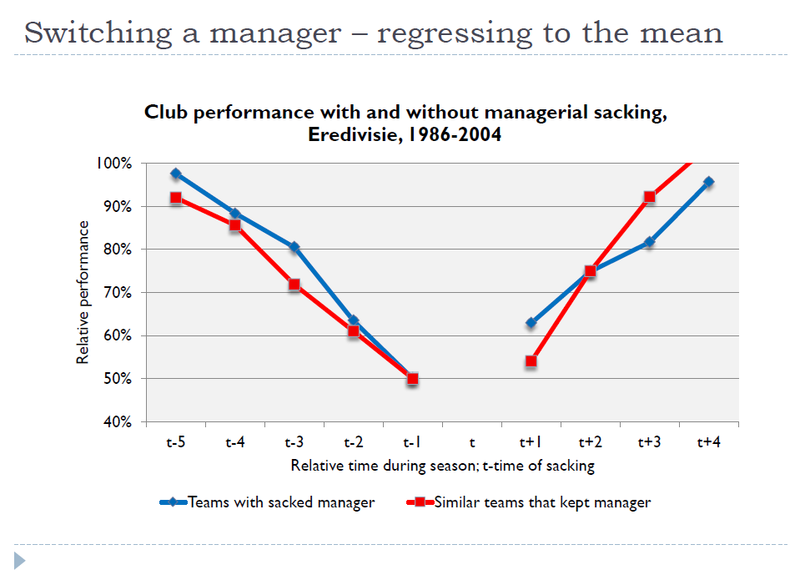 This is shown in the second graph, where the red line indicates the control group - similar teams that kept their managers. Their performance after the drop in form picks up and it tends to be even better after the next 5 games with the old manager in charge. So yes, the new manager did bring something into the team. Perhaps he brought back some confidence, but in the end the team simply regressed to the mean. Going back to Chelsea, every one of their teams taken by interim managers was a very good team. Every one of them had stellar players like Drogba, Lampard, Terry (the backbones of Chelsea for eight seasons), in addition to a number of other stars. These players don't just forget how to play football. They experience a set of poor performances after which it is expected, due to their quality, for them to bounce back and start winning again. As they are currently doing in the second half of this season (well, apart from last night). Remember, even Barcelona has a spell of poor performances every now and then when you compare all of their seasons put together (last season they started roughly, before eventually winning the treble). To show you how over-performance and regression to the mean can last for whole seasons, think of Liverpool during Brendan Rodgers' three seasons in charge. First season - poor; 7th place (even with Luis Suarez scoring 30 goals), second season - brilliant; 2nd place and a run-in for the Premiership until the bitter end (again Suarez scored 31 goals, but with great performances from the entire team including the talisman captain Steven Gerard - oh God, I'm starting to sound like a sports writer, am I? ), and the third season again poor; 6th place (albeit without Suarez in the team). So Liverpool were extraordinary under Rodgers only for one season (and even in that season it was actually the second part of it when they really excelled). Liverpool under Rodgers simply regressed to the mean - which was ok, but not particularly good either. The new manager Klopp is faced with having to lead the same team in their regression to the mean for yet another season. Expect somewhere between 5th and 7th place (this is unfortunate for me to accept as a Liverpool fan - but as a fan I may at least hope and dream). Regression to the mean also tells us why there is no such thing as a hot streak in sports. Many will not agree and cite momentum and team spirit in light of great performances. All that is true, no doubt about it, but in the end, when you look over a thousand games, of course you're gonna observe the team winning 30 or 50 times in a row. Imagine throwing a coin a thousand times. You know the end distribution will be around 50-50. Perhaps 502 heads and 498 tails, but it will be close to 50-50. Is it really impossible to image that in one point you throw 50 heads in a row? Try it. If you have time, throw a coin one thousand times, and do it several times across a few days. Report the odd results and be amazed. Of course, good teams amass to more wins than losses over those thousand games (just ask Alex Ferguson), but even they ride on luck a big portion of the time. This is not to say skills aren't important, along with all the other stuff, but luck carries a great weight in sports. After all, that's what makes sports unpredictable and that's precisely why we like it! The second thing about the article (and sports conversations in general) is more related to its conclusions and implications. If all previous interim managers were that good, Hiddink will (again) surely follow in their footsteps and achieve success this year for the club. This is historicism at its worse. Using a few historical anecdotes to draw powerful predictions about the future is naive at best, dangerous at worse. In an occupation like football (sports in general) where successes and failures have A LOT to do with luck (yes, skills are important, money is important, training and game strategies are important, but 50% of it is just pure luck - read all about it here), history is completely irrelevant about inferring future performance. For example, what were the expectations about Leicester City's current season performance based on their last season performance? Note: Leicester was fighting for survival last season, while they are top of the table this season with a good chance to win the Premier League! Many pundits expected them to be relegated this season, based purely on observing their past performance. At the same time many of the same pundits expected Chelsea to dominate the Premier League for another season after they were champions last year. But they didn't. Past performance is meaningless in football. The same goes for 80-year long curses and traditions that apparently are bestowed upon some clubs or players. Or why one club simply cannot win an away game at a certain stadium - it must be cursed! Until of course the club wins there. And surprise, surprise, the curse is broken. The only thing more silly in the world of football that I can think of is the so-called Ramsey curse - every time Aaron Ramsey, an Arsenal midfielder, scores a goal for his club, a famous person dies. Not only is this ridiculous in so many levels, it is also a serious example of selection bias. Famous people die all the time, regardless of whether Ramsey scores goals or not. In other words, how many times did a famous person die when Ramsey DIDN'T score a goal? To paint an even clearer picture about the Ramsey curse, here's an anecdote from Taleb's Black Swan about Cicero (it was Cicero telling the story about another person, but I'll just use Cicero as the main protagonist). They've shown Cicero a painting of soldiers surviving a shipwreck and praying to the gods (presumably Neptune, the god of sea) to save them. They all survived, and this was supposed to be interesting evidence about how a prayer can save your life. Cicero's response was: "where are the paintings of those who prayed and then drowned?". And I'll leave you with that. Hi Vuk, great post here. Really enjoyed it. As a Spurs fan, I am really hoping Leicester regress to the mean here in the final 7 games, and quick. Well, perhaps you're out of luck then :) this weekend they all but secured it.